To be able to withstand also very high temperature in a warm water system, our heating tape are able to withstand 100°C switch off and switch on. By this the risk of dammage is gone. 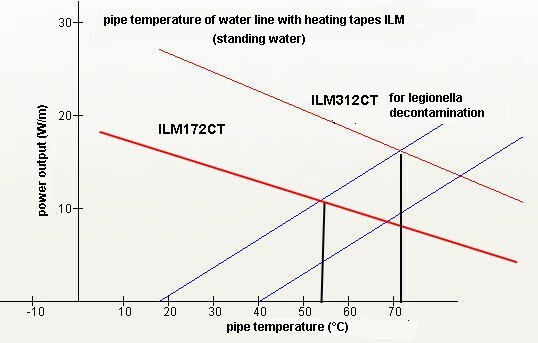 ILM172CT is used as a substitute for circulation pipes. Together with a time switch you can reach a high economic system. Only the time you need warm water, the tapes are switched on. For the use of ILM312CT as a legionella decontamination you will need a 'legionella-switch', which switch on to 100% power output for the decontamination time and switch down to 55% to only have comfort heating for warm water. By this you have no danger of scalding.